A Nottingham man has now been held in custody for two weeks after he was accused of “threatening behaviour” due to comments he allegedly made during his Atos benefits assessment. 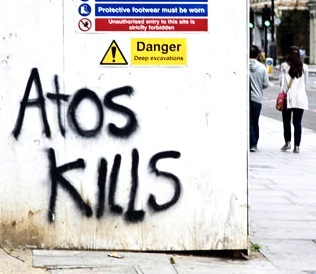 Steve Topley is a 49 year old father with multiple serious health problemswho was required to attend a Work Capability Assessment with the notorious IT firm Atos – the company responsible for stripping benefits from hundreds of thousands of sick and disabled people. During the process Mr Topley made some comments about someone not present at the assessment. His family say these comments were misunderstood and were in response to questions from the assessor about his personal life. These comments led to Atos staff calling the police and Mr Topley was asked to attend Queens Medical Centre (QMC) in Nottingham. When he refused to do so he was arrested. At QMC he was de-arrested and received a mental health assessment but no reason was found to detain him under the mental health act. He was then re-arrested and taken in handcuffs to Nottingham police station where he was later charged. His family have not been allowed to visit him in prison and have raised concerns that his medication may not be being administered properly. Mr Topley will face another appearance in a closed court tomorrow (Friday 26th April) and there are major fears that he will be remanded once again pending psychiatric reports. His family and supporters have called a demonstration outside the court tomorrow calling for his immediate release. Britain, like the US, is becoming a corporatist police state similar to Germany in the 1930’s. Just as then, we now see the disabled being denied natural justice, being forced into a hopeless situation, and left to die, which is, in effect, no different to the Nazis’ euthanasia policies. If it took the Government the same amount of time to introduce positive measures instead of negative ones the Country would be on its way to recovery instead of its Demise .CCS Closed Court Sessions were sneaked in without much Media attention and are now in practice when ECHR is ditched it will be little more than a Nazi state practiced in 30’s Germany.All Rights ‘surrendered ‘to the State .A man arrested for threatening behaviour at an ATOS assessment was in custody before he appeared before a Closed Court then remanded back to Police custody .He has been denied family visits and representation . HEAR HEAR…it’s the 1930s with no right to free speach…who the hell do these people think they are..tory bastards.